John Henry González Duque, a presenter for Witness for Peace from Colombia, will speak at 10 and again at 11 a.m. Oct. 7 in Sydnor Performance Hall, Schewel Hall. The talk is sponsored by the Chaplain’s Office, the Bennett Lecture Series, and the Dean of Students Office. 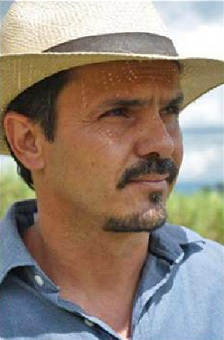 Duque co-founded Movimiento Campesino de Cajibio (Small Scale Farmers Movement of Cajibio), which works to promote a decent and dignified life for small scale farmers, with water and food security and land ownership rights. In 2008, MCC took part in the Minga of Social and Community Resistance in which a public debate was held with the president and was followed by a walk from the south to the capital of Bogota. In the process, about 50,000 people, including members of the indigenous community, students, trade unionists, women and residents of urban areas, joined the march. Witness for Peace is a politically independent, nationwide grassroots organization committed to nonviolence. WFP’s mission is to support peace, justice, and sustainable economies in the Americas by changing U.S. policies and corporate practices which contribute to poverty and oppression in Latin America and the Caribbean.